Belgian Beer Tasting at The Dovetail. Autumn Beer Tasting evenings at The Dovetail. At The Dovetail we know a thing or two about Belgian Beers. Why not join like minded individuals with a love of beer and a desire to learn more about the tastes and styles. 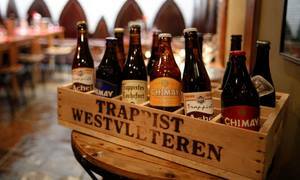 Each of our group tastings is different and covers a wide variety of Belgian beer and food pairings. Dates are Tuesday 13th September and Tuesday 4th October 2016. Places are limited so reserve your seat early! Tickets are £30 pp inclusive of tasting of 8 beers and matching food pairing. There is no minimum number and individuals or groups can join us to unwind and enjoy an evening with fellow beer lovers. For more information and to watch our beer tasting videos here.